Spring is definitely here and summer is not too far behind. 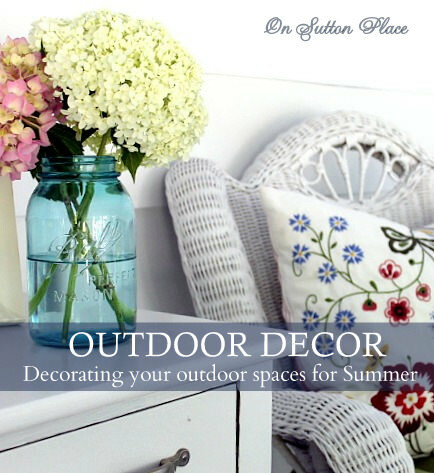 It’s time to ready your outdoor spaces so they feel like an extension of your home. 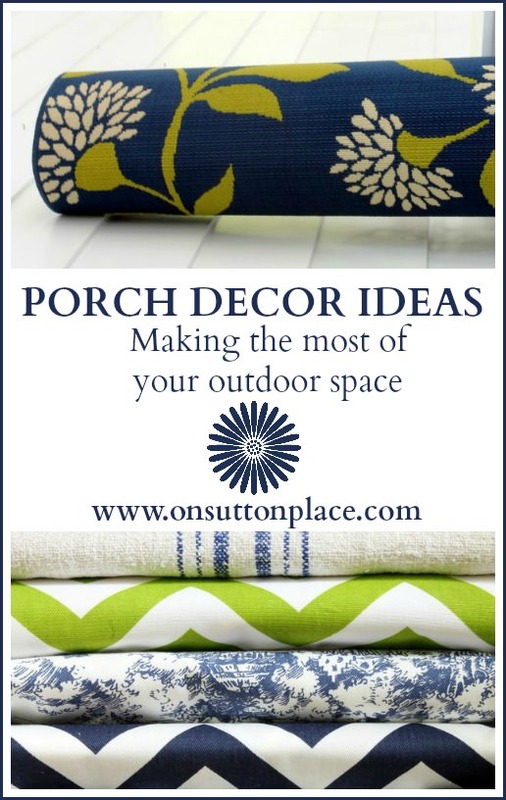 Over the next week or so I will be sharing porch decor ideas and how to make the most of your outdoor space. I love porches. Back or front, open or screened-in, big or small…I’ve never met a porch I didn’t like! My home has 3 distinct outdoor areas. A front porch, a back porch and a deck. Let’s start with the back porch. Here it is looking pretty sad and forlorn. It’s very basic with not a whole lot going for it. The screens were in terrible disrepair from branches flying into them. I’ve patched and patched but it was time to start fresh. New screens were installed so all the patches are gone! Next on the list is a new ceiling fan. 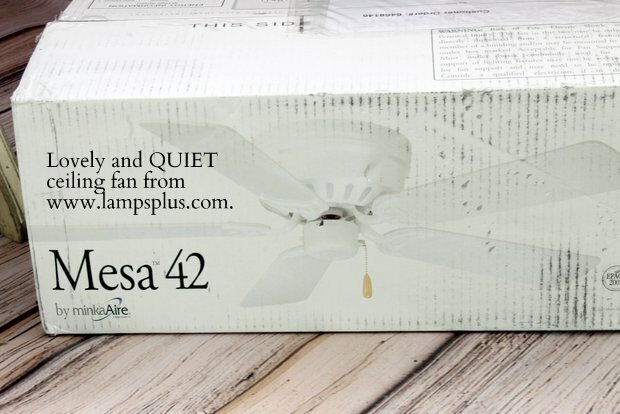 Thanks to Lamps Plus, I can get rid of the current noisy fan with wonky blades! A ceiling fan enables you to use an outdoor space even when the temps start to rise. It’s amazing the difference it makes. I have white walls and white wicker furniture so to bring in some color I add a bright outdoor rug and lots of pillows. Mixing patterns and colors makes it feel more like a room and not a porch. 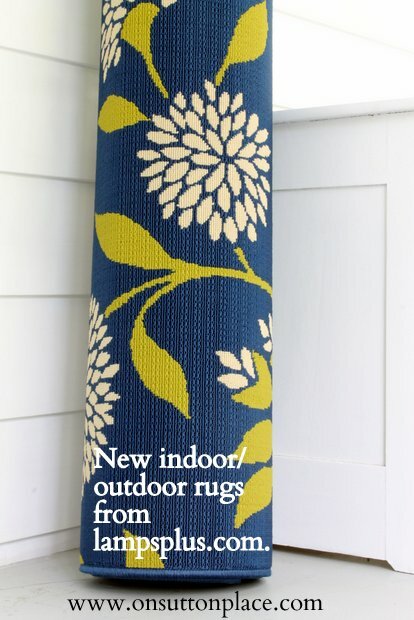 This beautiful navy rug from Lamps Plus is one of many available on their website. Covering up the plain cement floor really helps this space seem like a livable room. Here is a look at some of my fabric options. I’m not sure which ones will make the cut…although it’s a pretty safe bet that the grain sack and the toile will make it! I am in the process of making new valances. I chose a white cotton duck and I hope I’m not disappointed when they go up. Not sure about all white but I’m giving it a try. That’s what I’m up to around here. As soon as I get the valances hung and the pillows fluffed I’ll be sharing how it all came together. By combining comfortable seating, soft furnishings, lighting and loads of color you can turn any outdoor space into a great place to hang out. To see how the back porch looked last year just click the image below. « 12 DIY Curb Appeal Tips – on a Budget! While a smaller chandelier in a huge space will seem absolutely out of space. of the roaring twenties through the 1930s. Love the colors you chose! Can’t wait to see it all come together! I love that rug and your fabric choices! It is going to be absolutely gorgeous… I can’t wait to see! I am so excited to see the new porch. I am very curious!! I love the grain sacks and toile. Very French and very pretty! Can’t wait to see it all together….. the rug is gorgeous !!! I share your love of porches. I can’t wait to see your porch all spruced up for the warmer months ahead. Lamps Plus is a great partner. You have some great plans and exciting fabrics to work with. My fingers are itching to make more pillow covers and do something with my back porch. Right now it is full of furniture that I took out of my basement. I put my sewing machine out in some unused space, but the furniture had to go somewhere. You have given me some good ideas, thanks so much! I can’t wait to see yours finished! Yes if the rain is blowing around it comes in the porch. Putting in real windows will never be an option so I have to not worry about things getting wet. It all dries out and I’ve never had any real trouble. Thanks for visiting! Great rug and love the fabrics! Your new rug is fabulous and the flowers sort of look like your flowers in your logo. I went over to their site and just got lost for a few minutes ogling over all the styles they have. I’m looking forward to more of your porch ideas! Ann, I LOVE your new rug and I can’t wait to see how you put it all together. 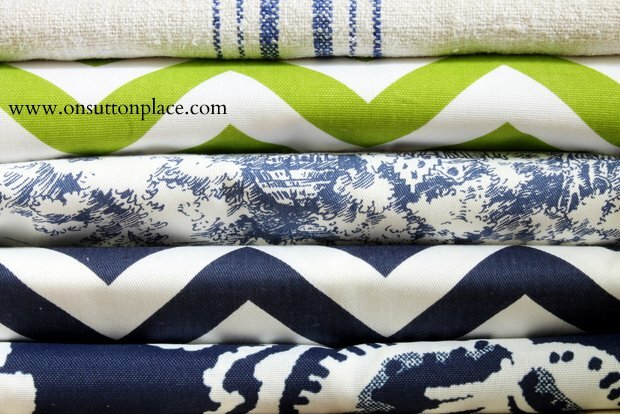 I have been looking at outdoor fabrics to make some new curtains for the porch. So expensive so I thought about using cheap, ready made white curtains and then I would embellish the top. Love the colors you are using! I can’t wait to see it al put together! I love the colors you are using. Just dying to see the finished product! Wow- you are such a TEASE!!! Wondering how your blades got so wonky? Or were they always like that, just designed that way? Never saw that before, though no one knows like I do how wretched Ohio weather can be – was it that? 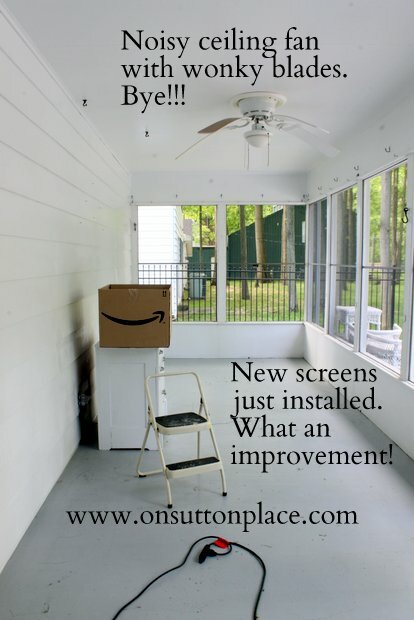 Anyway, I can’t wait to have a screened porch and a ceiling fan, definately in our plans! Going to be great- can’t wait to see the finished space. I think the fan blades sag from the heat and humidity. Of course when the fan is on you can’t tell anyway! But it’s very noisy and basically worn out. Time for a new one! I can’t wait to see your new porch decor Ann. I love the rug you chose. I checked out last years look and it was so pretty and comfy looking. Have fun sewing up your new look! It’s gonna be beautiful! You have such a comfortable, yet elegant touch. Waiting to see…. Ann, your colors and fabric are perfection! They scream “SUMMER” and will be cool in the heat. You’ve gotta add the green chevron in small doses! Can’t wait to see what you come up with!!! A question: do you use a Sunbrella type of fabric? I have had so many fabrics fade in the sun.